A South Florida man whose car was stolen with his 6-year-old son in the back seat chased the car down, then repeatedly shot the car thief, according to published reports. The Palm Beach Post is among those reporting that Lamar Thurman, 29, stole the 2012 Honda about 2:30 a.m. Saturday. Thurman was taken to the hospital in critical condition. The Post reports that he likely will face criminal charges if he survives. He was just released from prison on Feb. 4 after serving three years for carjacking, robbery and aggravated battery of an elderly person, state records show. We can only hope that Lamar doesn't make it. He's used up more than his share of chances as it is. Intelligence is apparently not required. Two police officers inadvertently shot each other in Elk Grove while attempting to apprehend a burglary suspect on Saturday night, according to the Elk Grove Police Department. Both officers sustained apparently minor gunshot injuries to their legs and were later released from an area hospital. When they arrived at the scene, officers found a male and a female, and ordered them to sit on a curb. While another officer was arriving, the male suspect, who the Elk Grove Police Department has only identified as a 41-year-old Sacramento man, stood up and ran away. Officers chased the man both by cruiser and on foot to a nearby shopping center, the release said. The two officers stood on either side of the suspect, who then moved toward one of the officers with “his hands near his midsection area,” the release said. The two officers shot the suspect, but during the altercation, both officers sustained gunshot wounds to the lower legs. The suspect did not shoot at the officers, Elk Grove Police Department spokesman Jason Jimenez said, and both wounds were a result of the other officer’s gunshots. They must hire kids straight out of junior high school. Most sane people realize that if you have a weapon in your hands, you don't position yourself in the line of fire from someone else who also has a weapon. No word as to whether one was named Barney Fife. Sol Pais, an 18 year-old Florida woman who was allegedly "infatuated" by the Columbine school shootings, was the subject of a BOLO by police after reportedly making "credible threats" against schools in the Denver area. But she was found dead today near the base of Mt. Evans in Colorado. So much for that little issue. 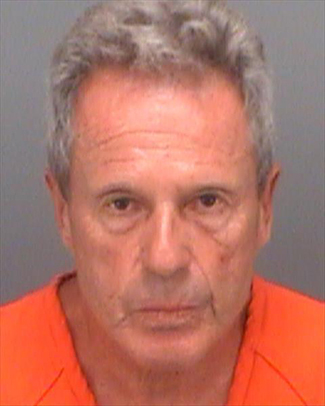 APRIL 15--Armed with a water gun filled with his own urine, an elderly Florida Man squirted a woman several times as she walked her dog in front of his residence Saturday evening, according to a complaint affidavit. Which is to say, the guy invented a water pisstol. Avoid these sorts of incidents, people: always pick up after your dog! An investigation has been launched after a Dutch fighter jet shot itself with its cannon, forcing the plane into an emergency landing. I have no idea as to how one manages to accomplish such a feat; apparently the Dutch are really inventive. LONDON (Reuters) - Walmart-owned British supermarket chain Asda said it will remove single kitchen knives from sale in all its stores by the end of April. Britain’s knife-crime rate is soaring and, following a wave of fatal stabbings in recent weeks, many involving teenagers, Prime Minister Theresa May has convened a meeting of ministers and community leaders to discuss ways of tackling the problem. “We know single knives are the most common knife products to be stolen and that is why we have chosen to remove these items from our stores,” Asda Senior Vice President Nick Jones said in a statement. It is illegal to sell knives to under-18s in Britain. Well, since they have strict gun-control, killers have to turn to other means. An elderly man allegedly pointed a handgun at a Lake Mary couple during a dispute over a parking space for the disabled at Disney’s Animal Kingdom, according to Orange County sheriff’s records. It's unclear who got the parking space. My view has always been that if you're planning to visit Disney World, the best bet is to get there early; not only is it easier to find a convenient parking space, but you don't lose a lot of time waiting in line - the lines start kicking in shortly after ten a.m.
Five people are dead, five City of Aurora police officers were injured and multiple other civilians were injured in an active shooter situation in west suburban Aurora Friday afternoon. The gunman is also dead, police said. Aurora police said that officers responded to the Henry Pratt Company just before 1:30 p.m. Police said two of the four first officers on the scene were fired upon immediately. More officers arrived as backup and were also fired upon. The ABC7 I-Team said law enforcement sources told them Martin was told Friday he was being fired from the company where he had worked for about 15 years as an assembler, and that it was during his termination meeting that he produced his gun and began firing, then went out into the plant at large and continued shooting. The company is one of the largest manufacturers of valves for water systems and other applications in North America. It's a subsidiary of Mueller Water Products, Inc.
Martin was convicted on felony charges in Mississippi back in 1995, and therefore could not legally own a gun. Speaking of guns: A home where infamous gangster Al Capone once lived with his wife, mother and sister is on the market. Asking price is a mere $109,000 for the place on Chicago's South Side. The six-bedroom home sits on a double lot at 7244 S. Prairie Avenue and features hardwood floors, wood trim and large, octagon-style living rooms. Wonder if Geraldo Rivera will tender an offer? APEX, N.C. (AP) — The FBI tracked a man they think was one of the country's Ten Most Wanted Fugitives to a North Carolina motel, where agents shot and killed him on Wednesday. The armed suspect shot to death at a motel in the Raleigh suburb of Apex will be identified by state medical examiners but was believed to be 47-year-old Greg Alyn Carlson, the FBI's North Carolina office said in a news release. Authorities said he was wanted in connection with multiple armed sexual assaults including a burglary and sexual assault in Los Angeles last fall. "Agents approached the room and tried to take Carlson into custody. Following an altercation over a gun, Carlson was shot to death by FBI agents," Paul Delacourt, assistant director of the FBI's Los Angeles office, said in a press conference.